Brassica campestris narinosa (L.H.Bailey) Kitam. Tat soi is an annual to biennial plant developed in cultivation from Brassica rapa. Growing from a non-fleshy taproot, it forms a rosette of spreading leaves and, eventually, a flowering stem up to 100cm tall. Tat soi is often cultivated, especially in the Orient, for its edible leaves. The oil contained in the seed of some varieties of this species can be rich in erucic acid which is toxic. However, modern cultivars have been selected which are almost free of erucic acid. A cultivar of garden origin. 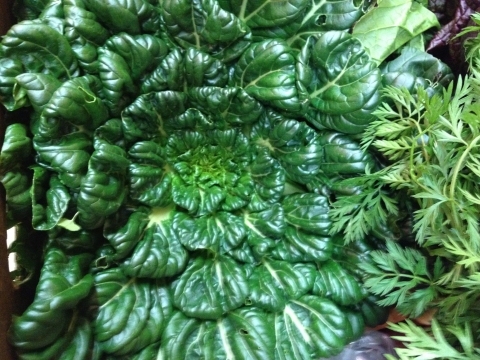 Tatsoi has been developed in cultivation in the warm temperate zone of China. It can be grown as an annual from the temperate zone to the tropics and can also be grown in the cold season in the temperate zone, where it can tolerate temperatures down to around -10°c and can even be harvested from under the snow. Leaves - raw or cooked.